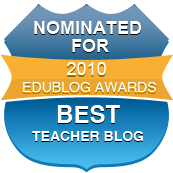 This blog has been nominated for an Edublog award in the category of Best Teacher Blog. If you feel this blog has earned this distinction, you can vote for it here. I mentioned on Twitter tonight that I have some mixed feelings about these kinds of awards. I think often this particular awards competition turns into a popularity contest. As far as I know, this is the first time I’ve ever been shortlisted for any sort of Edublog award, but I see a lot of the same names appear on these award shortlists over and over. Also, I don’t know about a Lifetime Achievement Award. Education blogging has only been around about ten years or so, and Lifetime Achievement doesn’t seem like the best language to use. I also don’t really think these awards are necessarily about good or helpful writing or tweeting. Don’t get me wrong: I’m honored that any readers enjoyed this blog enough to feel it deserved to be nominated for the award. As far as I’m concerned, if I was that helpful to anyone, then I won. I think Edublogs does good work, and I think it’s nice that they recognize the hard work of other bloggers, even bloggers that don’t use their service, but I also don’t like the idea of “competition” for this sort of thing. I like to see blogging, tweeting, and wikis as collaborative, as conversations. I like to reflect here, to share resources. If there were any awards for blogging when I started doing it five and a half years ago, then I didn’t know about them. I would hate to think anyone was motivated by these awards (and I actually don’t believe that). Who knows? Maybe it bothers me that this blog has never been recognized until now—I fully admit my ambivalent feelings about blog awards could be tied to the fact that I haven’t won one. If I had, perhaps I might value them more highly. I think this kind of thing is different from teaching awards, such as teacher of the year. The process for selection is so different. As far as I know, the process is blind in that judges evaluate the parts of a TOY application without knowing the nominees or perhaps even knowing the names of the nominees. The application package I submitted included a description of a typical day in my classroom, two letters of recommendation (one from a student and one from my headmaster), my philosophy of education, and descriptions of two sample lessons. I have no idea how many people were in the running for the award. I can tell you that I tied for GCTE’s Secondary Teacher of the Year. The reason GCTE selected me for the NCTE Secondary Section Teacher of Excellent Award is that they could not recognize both of their winners for the ToE award, so they took a revote, and I was selected. That award means a lot to me because I was selected by other English teachers—my peers. While Edublogs awards work in a similar fashion, I think it is dominated (and understandably so) by “tech” folks—instructional technologists, technology educators, and ISTE folks. They would, after all, be the most comfortable with blogging, at least early on. Older blogs have an edge in this competition, and most of those older blogs are owned by tech folks. But tech folks aren’t the only ones with great ideas and knowledge to share, and I think in recognizing these same people over and over, we are missing out on some great new voices or even some older voices who for whatever reason are not nominated. One of the reasons this blog has a high page rank in Google is that it’s been around for five years, so lots of people have linked to it (and thank you!). If I’m honest with myself, I’m not sure it is the best teacher’s blog out there, or even the best English teacher’s blog—it is, however, one of the oldest. I’ve been very absent from writing here as I attended graduate school. I have felt uninspired with regards to this blog, too. As a result, I haven’t posted a whole lot on this blog in the last year or two. I do feel that may have changed in the last week, but the year as a whole has not been a stellar blogging year for me, at least not here (my book blog is quite another story, and frankly, I think the nomination and shortlisting process for Book Blogger Appreciation Week is much more sound and thorough—and no, that blog wasn’t nominated for a Book Blogger Award because I didn’t submit my blog for one). Actually, I think Silvia Tolisano’s Langwitches blog has probably been the most influential teacher’s blog I’ve read in the last year. Plus the witches are extremely cute. It has a great design and great writing. And she updates frequently. Thank you for reading. Thank you for nominating me. I voted for you tonight! Good luck! Thanks, Mitch! I love working with you. I began my blog with the quite ambitious idea that I would post often; however, that did not happen! It did allow me, though, to truly appreciate those of you who do blog often. Your blog has certainly inspired me, and I brag about all that I've read and learned from you. Thanks so much, Dana. The awards recognize leadership in our profession-both present and future. You are a leader for many of us, no question. If an award brings more teachers to the site and inspires their work, then it is a win-win for all. You are the first blog I tell my colleagues to read when they finally decide to venture into PLN territory. Thanks. You've got my vote.